Mumbai: The rupee’s rapid slide against the US dollar has caught many importers unawares as they did not limit their currency risk by booking forward dollars. Many are still waiting for the market to correct and the rupee to strengthen, but they may not get a chance in the short term, say currency dealers. Neither companies, which need dollars, nor banks, which advise them, anticipated the sudden slide in the rupee. While for exporters it’s a lost opportunity, importers need to shell out more dollars for current overseas purchases. According to estimates by traders and currency consultants, about 50% of the $40.43 billion import bill is not hedged. 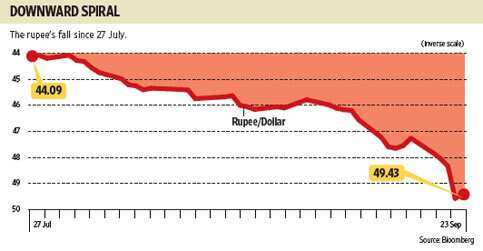 The performance of the rupee against the dollar suggested an appreciation bias until two months ago. Armed with this view, importers, including large public sector oil marketing companies and utilities, did not hedge their exposures. Initial strengthening of the dollar was ignored and companies, expecting the situation to ease, adopted for a wait-and-watch approach. “It seems that many firms were complacent and did not want to hedge loans and imports at appropriate levels. In the absence of an appropriate risk management strategy or non-adherence to it, layers of stop-losses are being triggered and some companies’ balance sheets are in duress," said Satyajit Kanjilal, managing director of Forexserve, a currency consultant. Currency dealers say many big Indian companies have entered into so-called principle-only swaps, which convert rupee debts of firms into dollar debts, and went short on the dollar expecting the greenback to be cheaper in the future. This strategy works well when the dollar is expected to weaken because the company pays less for its dollar debt. The market had a view of rupee becoming 42-43 a dollar in three months. The Indian currency was trading at 43.86 a dollar July-end. On Friday, it touched 49.89 a dollar, a full ₹ 6 drop in exchange rates. The rupee fell to a 28-month low of ₹ 49.89 per dollar on Friday, but recovered to end the week at ₹ 49.43 a dollar after the Reserve Bank of India (RBI) sold dollars through a clutch of public sector banks. Firms that have not hedged exposures are slowly entering the market with a hope to arrest the impact of the rupee slide on their balance sheets. Bankers say the fall was both unexpected and rapid, and even companies that follow a “consistent hedging policy" could be hit. “Nobody was prepared for this move, so there is no question of measuring the gain or loss. But if companies follow a consistent policy that allows them to be either fully or partially hedged, they will gain more than lose," said Ashish Parthasarthy, treasurer at HDFC Bank Ltd.
Bankers said though some exporters may rue the missed opportunity to sell the dollar at current high levels, the importers with immediate payment obligations will be hit most. Chief financial officers of many companies admit their tested hedging formulas do not work in the current situation. Most hit are oil marketing companies which pay in dollars to buy crude oil from abroad. The rising dollar has suddenly increased the cost of oil for these companies, adding to under-recoveries—losses from selling fuel below cost—as these companies are not allowed to pass on the market rate of fuel to consumers. K.V. Rao, executive director, finance, Hindustan Petroleum Corp. Ltd (HPCL), one of the three largest oil marketing companies, said the runaway gains for the dollar has the potential to expand the under-recoveries for the company. “The fall in crude prices has neutralized the impact of a weaker rupee," he said. “Our average cost of crude is $110 per barrel but it would have been somewhere around $105 to $106 per barrel had it not for the rupee’s fall." Crude oil November futures on Brent have fallen to $104 per barrel from $115 per barrel, or 9.4%, from the beginning of September. But in the same period, the rupee has fallen 6.6% from around ₹ 46 a dollar. Jamal Mecklai, chief executive at Mecklai Financial Services Ltd, a forex consultancy, said sharp currency movements every few years should not come as surprise. “What is surprising is that our exporters and importers remain unhedged in this market and cry foul when things go wrong. Our currency market is not as volatile as other global currency markets, but going by the movement in rupee in the last few days, it looks like it is behaving as the commodity markets," he said. In a report titled Sliding INR-Impact on India Inc, Ajay Parmar, head research, institutional equities, Emkay Global Financial Services Ltd, said 76 out of 160 companies tracked by his firm are either gaining or losing because of the volatile rupee. “Amongst obvious gainers is the information technology sector with large export revenue in dollar terms. Other sectors gaining from the depreciation of rupee are metals (realization largely in dollar terms) and fast-moving consumer goods," Parmar wrote in a note released on Friday. “The sectors experiencing negative impact are auto (being net importer), cement (exposure to imported fuel), capital goods (being net importer) and utilities (exposure to imported fuel and foreign currency loans)." Emkay expects information technology companies HCL Technologies Ltd, Tata Consultancy Services Ltd (TCS) and Wipro Ltd to lead gainers as they can sell dollar revenues at higher rupee realizations. HCL will gain 16%, TCS 7.2% and Wipro 7.2% in earnings for financial year 2011-12, Emkay says. Emkay said firms such as car maker Maruti Suzuki India Ltd, which have to buy steel to make cars, besides other small parts from abroad, have also been hit. Emkay expects Maruti’s earnings to be negatively impacted by 15.2% because of the rupee’s decline. Also negatively impacted while be Bharat Petroleum Corp. Ltd (BPCL), which imports crude oil, and power producers such as Adani Power Ltd and JSW Energy Ltd, which have to import equipment as well as raw materials such as coal to run their plants. Emkay expects BPCL’s earnings to be impacted by 3.1%, while Adani Power and JSW Energy are likely to lose 2.5% and 2.4% of their earnings estimates, respectively, for financial year 2011-12. “Traditionally our current account deficit has been funded by robust capital flow. The oil price slowdown will definitely narrow our deficit but it remains to be seen how the capital flows behave," said Indranil Pan, chief economist at Kotak Mahindra Bank Ltd. Exporters, mostly software companies, are the biggest gainers in the current scenario. The chief financial officer of a large software company acknowledged that the rupee’s fall against the dollar has left his company and its peers in an advantageous position, but cautioned that the gains may not be a windfall because his company always hedges on a short-term basis. “We have short-term hedges, which typically are for every two quarters. What we do is sell dollars in tranches, so the impact will be positive but not in a big way," he said on condition of anonymity, as his company is in a silent period before announcing its September quarter results next month. He added that the company will not change its strategy because of the rupee’s recent fall. “Global markets are volatile and are likely to remain so. It doesn’t make sense to change strategy, but we expect the rupee to depreciate further towards ₹ 50 a dollar," he said. There are also firms for whom the impact of rupee depreciation is muted because they both import commodities and price receivables in dollars. Seshagiri Rao M.V.S., joint managing director and group chief financial officer at JSW Steel Ltd, said, their “landed cost" of steel neutralizes rupee’s impact. “Our sales pricing, like other steel companies, is in dollars. So whenever there is a hike in import costs due to a weaker rupee, its gets passed on to our customers," Rao said. “It won’t have much impact on our revenue." About 20% of JSW Steel’s sales are exported and the company usually makes payments for raw materials such as coal within a month’s time, Rao said. Both corporations as well as bankers accept that the rapid fall of the rupee is more of a knee-jerk reaction. “This is a one-way market, depending on all external factors. The dollar is currently seen as a safe currency globally and, hence, the value of the dollar has been reflected in the rupee," said J. Moses Harding, executive vice-president and head, global markets group, IndusInd Bank Ltd. The global dollar index, which tracks the measure of the dollar value to a basket of six other currencies—the euro, yen, pound sterling, Canadian dollar, Swiss franc and Swedish krona—has risen to 78.50 points from 73.27 in July. Rao of HPCL said the company cannot hedge purchases made every day because payments have to be made on a continuous basis. “All of this year we have bought most of the crude at 43, 44 and 45 per dollar. Our average cost of crude will still be lower for the year," he said. Oil companies raise foreign currency loans for working capital expenditure, which are hedged. HPCL, for example, hedges loans for three months and beyond. Economists say the global rush to buy dollars could make dollar funding unavailable for exporters. “Dollar liquidity could become an issue, which could impact things like export credit and could lead to forex credit tightening," said Dharmakirti Joshi, chief economist at rating agency Crisil Ltd.
Joshi is unwilling to take a guess on the rupee’s moves, given the global volatility. Samiran Chakraborty, head research, Standard Chartered India, said the biggest gain for India from the global uncertainty will be a fall in oil prices because it will help RBI to curb inflation. Kotak Mahindra Bank expects the rupee to move into the range of 50-52 a dollar in the near term. Forexserve sees the rupee touching 52.20 in six months, but there could be a minor correction in the interim. HDFC Bank sees the rupee to be at 47.50 a dollar by December. However, all of them could be prompted to change their forecasts, given the rapidly changing global dynamics. “In this scenario, there are so many moving pieces that it is difficult to predict the impact on balance of payments," said Pan of Kotak Mahindra Bank. “It’s a pressure-cooker zone situation."